Making its debut in the spring of 2013 with seven night cruises from New York to Bermuda, Norwegian Cruise Line's next ship, the Norwegian Breakaway Cruise will feature what the company is calling a major innovation in design; A quarter-mile-long ocean-facing boardwalk lined with restaurants, bars and shops. The Waterfront, as the area will be called, will span both sides of the NCL Breakaway cruise ship and boast eight outdoor dining and lounging options, including a steakhouse, an Italian eatery, a seafood restaurant, and a cocktail bar. New York restaurateur, Geoffrey Zakarian, will be bringing his 25 plus years of award-winning style and passion for fine cuisine to the Breakaway's new three-deck-high indoor complex of restaurants. Tied into the outdoor Waterfront, the complexes will have 17 dining venues and 12 bars and lounges. The Breakaway cruise ship will offer its guests a wide variety of cabins for all types of travelers to call home, from the innovative Haven concept, a brand new 42-suite private complex, to studios for guest traveling alone. Norwegian Cruise Ship Breakaway will also enhance its family image with the deck top Aqua Park, a massive water park featuring five water slides. 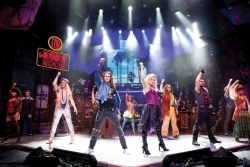 As always, as is the tradition of Norwegian Cruise Line, family entertainment will be a prominent feature aboard the Breakaway with the addition of some favorite Broadway shows such as Rock of Ages and Burn the Floor, with many more exciting features to be added. Click here to see the Largest Cruise Ship Suites.